Are capsule networks the next big thing in AI? A little over two weeks ago, Google researcher and leading AI-expert, Geoff Hinton, threw the AI world a curveball when he announced that the way we’ve been doing computer vision – a process he championed back in 2012 called artificial neural networks – is all wrong. The general understanding of neural networks, or the tech we currently use with AI, is this: You feed massive amounts of data (e.g., photos, text) through a filter comprised of many, many artificial neurons (AN), each of which looks for the presence or absence of one specific thing. With enough examples and enough ANs, you start to detect patterns and see if specific examples fit those patterns. Apple, Google and others use this for facial recognition, signature validation, etc. The biggest drawback to this technology is that neural networks need very large data sets in order to determine patterns and refine them to the point where they’re usable. It’s great for facial recognition, but not so great for, say, a hospital looking for a way to scan X-ray photos. The other drawback is that this takes a fair amount of infrastructure and technical expertise. It’s hard enough to get enterprises to care enough about Big Data to collect, clean and stage data for building dashboards; neural networks involve even greater requirements before they start paying off. Contrary to what many people think, a capsule network is a neural network. It’s an enhancement where artificial neurons are grouped into chunks, or capsules, that work as a team and focus on one kind of thing as a collective set. Consider facial recognition: We could put a Picasso-esque, cut-up collage of my face through a classic neural network that had been given many other photos of me and learned what I look like. It might see my nose, my eyes, my chin, etc., and determine that it’s me — even if those pieces were arranged randomly. A neural network, on the other hand, would look at those pieces as a set and insist that they appear in the right positions before declaring that they’ve detected my face. Also, it shouldn’t be forgotten that they can produce usable results with a much smaller data set compared to a classic neural net. Problems that couldn’t be tackled with neural networks in the past can be addressed with capsule nets. No matter how much hype you hear, nothing about AI is quite “mainstream” at this point. It’s being utilized, to be sure, and in an increasing number of places. But, there remain economies of scale and data quantity and quality barriers to entry – that, and the fact that neural nets, capsule or otherwise, are good for some business problems but not all of them. 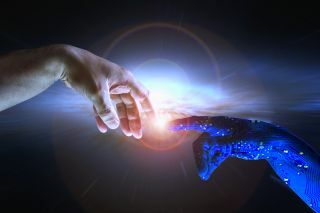 What is happening now, though, is the appearance of AI – and inevitably, capsule network technology – as consumable cloud services. Enterprises, especially mid-size organizations, need not implement the infrastructure necessary to “do AI” – they can just subscribe to it. It’s the lowering of barriers to adoption that’s interesting here. It’s not just Google; you can send a tweet about your company to Microsoft Azure’s sentiment analysis service and have it tell you how negative or positive it is. Your own data set can be tiny, but if you and others let a third party analyze all of your collective data, then the resulting network can achieve enough critical mass that can be used by all of you – without risking privacy. This means that AI, in a variety of forms, is about to become mainstream. Pattern recognition, prediction, etc.? You can add it to your app by calling a web service. Let’s call it Intelligence as a Service. Nintex is currently working to develop how we’d use capsule networks for intelligent process automation. For example, we can use it to identify time patterns for when you tend to respond to assigned review and approval tasks, and then use it to target reminders and notifications for those times to make sure you don’t ignore them. We can look at approvals and rejections you’ve done in the past to predict how’d you’d respond and offer default responses that match up — and put them into effect if you haven’t responded in time for a deadline. Capsule networks require more curation. They’re not as good at determining what the patterns are in the first place without any initial guidance. So, anyone looking to implement them needs not just technical expertise, but subject matter expertise as well. Another problem is that current implementations are not that fast, but we’re sure to see that change. Also, other developments might leapfrog it; feedback networks are looming on the horizon, and more elaborate artificial neurons are another way of making neural networks smarter. As for using capsule network technology day-to-day, well, yes – they can expect that, especially if they don’t need to build and maintain the networks and can simply rather subscribe to and use them. Moreover, taking this approach means that it’s up to the cloud vendors to adapt to changing developments and provide them to you – ultimately minimizing your risk. IT needs to be focused on using technology to aid lines of business, not geeking out on technology for its own sake. Intelligence as a Service solves this. Because the data set requirements are smaller, it lowers the bar to using this kind of tech – and that is extremely attractive. But remember, the price of that is you have to help teach the network what kinds of patterns to start with in the first place. It’s useful – really useful – but it’s not magic. Capsule network tech is positive, but we already have people thinking that it “changes everything.” Let’s sober up a bit. Capsule network technology opens some doors and closes others. It eases the burden of massive data requirements but perhaps at the expense of our ability to discover some unforeseen patterns. It’s great, it’s worth adopting, but we should move ahead with open eyes and clear heads.